Tips on Tips: Are your Tips Taxable? Receiving Customer Payments: What are your Options? Many small business owners ignore tax planning and don’t even think about their taxes until it’s time to meet with their accountants once a year. But tax planning is an ongoing process and good tax advice is a valuable commodity. It is to your benefit to review your income and expenses monthly and meet with your CPA or tax advisor quarterly to analyze how you can take full advantage of the provisions, credits, and deductions that are legally available to you. The IRS allows up to a 50 percent deduction on entertainment expenses, but you must keep good records and the business meal must be arranged with the purpose of conducting specific business. For more information on this topic see Deducting Travel and Entertainment Expenses, below. If you use your car for business such as visiting clients or going to business meetings away from your regular workplace you may be able to take certain deductions for the cost of operating and maintaining your vehicle. You can deduct car expenses by taking either the standard mileage rate or using actual expenses. The mileage reimbursement rate for 2017 is 53.5 cents per business mile. Section 179 expensing for tax year 2017 allows you to immediately deduct, rather than depreciate over time, up to $510,000, with a cap of $2,030,000 worth of qualified business property that you purchase during the year. The key word is “purchase.” Equipment can be new or used and includes certain software. Generally, depreciable equipment for a home office meets the qualification. Are you thinking of retiring soon, or changing jobs? You may face a major financial decision: what to do about the funds in your retirement plan. Note: As you will see, the rules on retirement withdrawals are quite complex. They are offered here only for your general understanding. Please call before taking withdrawals or making other major changes in your retirement plan. Partial withdrawals are withdrawals that aren’t rollovers, annuities, or lump sums. Because they are partial, the amount not withdrawn continues its tax shelter (see below). Note: Before retirement, partial withdrawals are fairly common with profit-sharing plans, 401(k)s, and stock bonus plans. After retirement, they are fairly common in all types of plans (though least common with defined-benefit pension plans). Tax Planning. A partial withdrawal is usually taxable and can be subject to the penalty tax on withdrawals before age 59-1/2 except under certain situations (see below) and when the distribution consists of after-tax contributions, such as nondeductible IRA contributions. Example: Your retirement account totals $100,000, which includes an after-tax investment of $10,000. You withdraw $5,000. $500 of the withdrawal is tax-free ($10,000 / $100,000 x $5,000). Note: The tax-free portion is computed differently for plan participants who have been in the plan since 5/5/86. Contact us for details. Exceptions for early distributions from IRAs and other qualified retirement plans include direct rollovers to a new retirement account, you were permanently or totally disabled, you were unemployed and paid for health insurance premiums, you paid for college expenses for yourself or a dependent, you bought a house (certain criteria must be met), or you paid for medical expenses exceeding 10 percent of your adjusted gross income. In addition, there are several less common situations where you might be exempt from paying taxes and early withdrawal penalties. Please call us if you would like more information. Preserving the Tax Shelter. Your funds grow sheltered from tax while they are in the retirement plan. This means that the longer you can prolong the distribution – or the smaller the amount you must withdraw – the more your assets grow. Some people choose to defer withdrawals for as long as the law allows to maximize assets and shelter them for the next generation. Note: The law has specific rules about how fast the money must be taken out of the plan after your death. These rules limit the ability to prolong a tax shelter. Until you reach 70-1/2, you do not need to take money out of your retirement account – unless your employer’s plan requires it. In fact, there will usually be a 10% early-withdrawal penalty if you make withdrawals before age 59 1/2. This is on top of the regular income tax you owe – at any age – on amounts you withdraw (though there’s no tax on after-tax contributions you made, as discussed above). Once you hit 70-1/2, withdrawals must begin. Technically they can be postponed until April 1 of the year following the year you reach 70-1/2 – say April 1, 2018, if you reach 70-1/2 in 2017. But waiting until April 1 means you must withdraw for two years – 2017 and 2018 – in 2018. To avoid this income bunching and a possible higher marginal tax rate, we may suggest withdrawing in the year you reach 70-1/2. Please call if you need assistance evaluating your particular situation. The rules allow you to spread your withdrawals over a period substantially longer than your life expectancy. Under these rules, the taxpayer (say, an IRA owner) first determines how much he’s saved as of the end of the preceding year. Then he consults a (unisex) IRS table to find the number for his age. The number corresponds to how long he may spread out the withdrawals. The owner then divides that number into the retirement asset total. The result is the minimum amount he must withdraw for the year. Example: Joe reaches age 70-1/2 in October of this year. Retirement plan assets in his IRA totaled $600,000 at the end of last year. The IRS number for age 70 is 27.4. Joe must withdraw $21,898 ($600,000/27.4) this year. Example: Two years from now, Joe is 72 and his IRA was $602,000 at the end of the preceding year (when Joe reached age 71). The IRS number for age 72 is 25.6. Joe must withdraw $23,516 ($602,000/25.6) when he’s 72. The number in the IRS table assumes distribution over a period based on your life expectancy, plus that of a beneficiary 10 years younger than you. If your designated beneficiary is a spouse more than 10 years younger than you, his or her actual life expectancy is used to figure the withdrawal period during your lifetime. Caution: You can always take out money faster than required – and pay tax on these withdrawals. However, the tax code is strict about minimum withdrawals. If you fail to take out what’s required, a tax penalty will take 50 percent of what should have been withdrawn but wasn’t. The IRS requires that you withdraw at least a minimum amount – known as a Required Minimum Distribution – from your retirement accounts annually, starting the year you turn age 70-1/2. Determining how much you are required to withdraw is an important issue in retirement planning. Contact the office now if you’d like assistance figuring out how much your withdrawal should be because getting those numbers right can make a big difference in the quality of your retirement. All taxpayers fill out a W-4 when starting a new job. This form is used by employers to determine the amount of tax that will be withheld from your paycheck. Taxpayers with multiple summer jobs will want to make sure all their employers are withholding an adequate amount of taxes to cover their total income tax liability. If you have any questions about whether your child’s withholding is correct, please call the office. Whether your child is working as a waiter or a camp counselor, he or she may receive tips as part of their summer income. All tip income is taxable and is, therefore, subject to federal income tax. 4. When to deduct. As a general rule, you must deduct a casualty loss in the year it occurred. However, if you have a loss from a federally declared disaster area, you may have a choice of when to deduct the loss. You can choose to deduct the loss on your return for the year the loss occurred or on an amended return for the immediately preceding tax year. Claiming a disaster loss on the prior year’s return may result in a lower tax for that year, often producing a refund. 6. The $100 rule. After you have figured your casualty loss on personal-use property, you must reduce that loss by $100. This reduction applies to each casualty loss event during the year. It does not matter how many pieces of property are involved in an event. 7. The 10 percent rule. You must reduce the total of all your casualty or theft losses on personal-use property for the year by 10 percent of your adjusted gross income. If you have any questions or need assistance, don’t hesitate to call. Do you work at a hair salon, barber shop, casino, golf course, hotel, or restaurant, or do you drive a taxicab? The tip income you receive as an employee from those services is taxable income. Tips are taxable. Tips are subject to federal income and Social Security and Medicare taxes, and they may be subject to state income tax as well. The value of noncash tips, such as tickets, passes, or other items of value, is also income and subject to federal income tax. Keep a running daily log of your tip income. Be sure to keep track of your tip income throughout the year. If you’d like a copy of the IRS form that helps you record it, please call. QuickBooks was designed to make your daily accounting tasks easier, faster, and more accurate. If you’ve been using the software for a while, you’ve probably found that to be true. Some chores, of course, aren’t so enjoyable, like paying bills or reconciling your bank account…Or anything else that has the potential to reduce the balance in your checking accounts. If you’re like many businesses, you send invoices to customers to let them know what they owe and when their payment is due. One of the most commonly used ways to record payments is by using the Receive Payments window by clicking on the Receive Paymentsicon on the home page or clicking on Customers | Receive Payments. Figure 1: Use the QuickBooks’ Receive Payments screen when you record a payment made in response to an invoice. Next, you will need to ensure that the payment is applied to the right invoices. If it covers the whole amount due, there will be a check mark in every row in the first column of the table. If not, QuickBooks will use the money received to pay off the oldest invoices first. 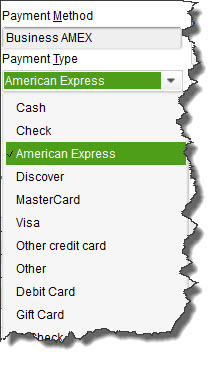 To change this, click Un-Apply Payment in the icon bar and click in front of the correct rows to create checkmarks. Complete this form much like you entered data in the fields of the Receive Paymentswindow. Then you can print the mail for the customer and/or email it. After all the hard work you’ve done to make your sales, the last thing you want to do is record a payment incorrectly so it isn’t processed and you don’t get paid. Though QuickBooks makes the mechanics of receiving payments simple enough, you still should understand the entire process involved in getting income into the correct accounts. If you need assistance with this or any other areas of QuickBooks, just call. Individuals – If you are a U.S. citizen or resident alien living and working (or on military duty) outside the United States and Puerto Rico, file Form 1040 and pay any tax, interest, and penalties due. (U.S. citizens living in the U.S. should have paid their taxes on April 18.) If you want additional time to file your return, file Form 4868 to obtain 4 additional months to file. Then file Form 1040 by October 16. However, if you are a participant in a combat zone, you may be able to further extend the filing deadline. Individuals – Make a payment of your 2017 estimated tax if you are not paying your income tax for the year through withholding (or will not pay enough tax that way). Use Form 1040-ES. This is the second installment date for estimated tax in 2017. Corporations – Deposit the second installment of estimated income tax for 2017. A worksheet, Form 1120-W, is available to help you estimate your tax for the year.